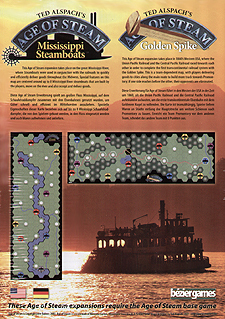 This Age of Steam expansion takes place on the great Mississippi River, where Steamboats were used in conjunction with the railroads to quickly and efficiently deliver goods throughout the Midwest. Special features on this amp are centered around up to 8 Mississippi River steamboats that are built by the players, move on the river and also accept and deliver goods. This Age of Steam expansion takes place in 1860's Western USA, where the Union Pacific Railroad and the Central Pacific Railroad raced towards each other in order to complete the first transcontinental railroad system with the Golden Spike. This is a team-dependent map, with players delivering goods to cities along the main route to build more track towards Promontory; if one side reaches before the other, their opponents are eliminated.